This statue was dedicated at the Balloon Museum August 4, 2013. The Children’s Peace Statue is a monument designed and funded entirely by children. In the fall of 1989, children of Arroyo del Oso Elementary School in Albuquerque, New Mexico were studying the Arms Race. During their studies, the students learned the story of school children in Japan who built a monument, the Genbaku No Ko No Zo Statue for Children Who Were Victims of the Atomic Bombs. Inspired by the story, the children formed the Kids’ Committee for the Children’s Peace Statue and made plans to design and build a peace monument of their own. The Kids’ Committee opened a nationwide design contest for the statue and designed and built a touring exhibit to promote the project. The group has cooperated with thousands of people from around the world and has collected the names of thousands of children who share their wish for peace. As pictured above, the statue is often covered with paper cranes, a symbol of peace. The sculpture was originally intended to be in Los Alamos, site of the Manhattan Project where the atomic bomb was designed. 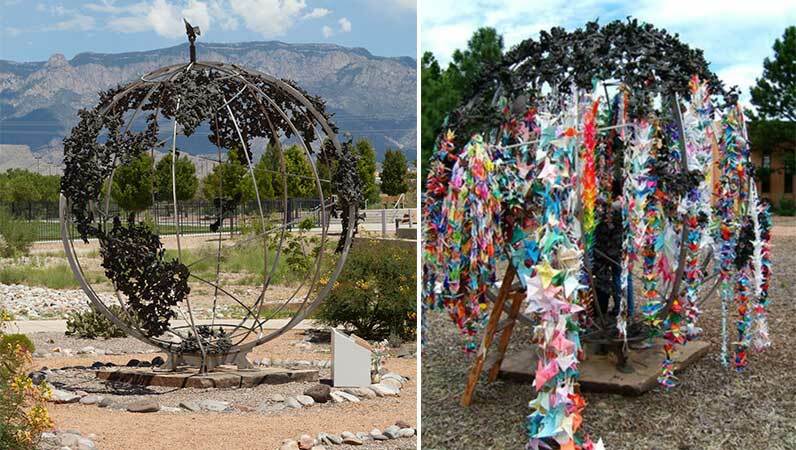 The Los Alamos City Council rejected it because they feared the park would become a rallying point for peace activists and be seen as an indictment of Los Alamos’ role in creating nuclear weapons.